We are pleased to announce that Good To Excellence has been awarded by Sulekha for its services and training quality provided to our students. This has been possible because of our students getting the best benefits and giving their reviews frankly. Our trainers ensured that each student received individual attention and maximum benefit of the training. Thank you so much students and our trainers! That’s what we trainers love to do. We train and prepare them for finest skills in language and soft skills so that they carry with them a lifetime of learning. We are expanding our operation, therefore we are now hiring trainers. Working with us is fun! Working with us is also satisfying. Working with us is flexible and rewarding! We are looking for people who are good in English – all round English. If you have experience, we shall train you in IELTS, PTE or Advanced English training course. If you are aspiring to be a trainer, certainly you will love working with us. We shall train you such that your student will respect you for your training. 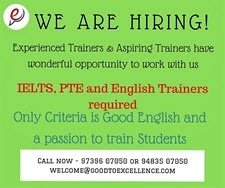 So, if you are interested, write to us at welcome@goodtoexcellence.com with your resume and we shall get back to you. Let’s discuss face to face and start a challenging work together! Apply now! Write to us. Hearty congratulations to Mithu and Kishore on clearing PTE. All the best for your future. Congratulations to Faraz and Vijay, our Advanced level students on getting placed in reputed companies. We are very proud of you. If you are interested in taking PTE exam, do reach out to us by calling our institute numbers 94835 07050 and 97396 07050. Front office receptionist – pleasant personality, good English communication, graduate in any discipline, some experience of similar work. Knowing Hindi and / or Kannada will be added advantage .Only Female candidates can apply. Trainer – pleasant personality, fluency in English communication (speaking, writing), good command over grammar and impressive vocabulary. Prior training experience is desired. Experience in soft skills training will be an added advantage. No age bar. Look forward to hearing from you and be part of growing Good To Excellence family. Here is an opportunity for all those who want a demo class for English communication skills. Come and have a feel of our class at Good To Excellence #4, service road off 100 ft road at Udupi Garden signal, BTM Layout 1st stage from 6-7 pm this Saturday 1st November. All are cordially welcome. Please call us on 97396 07050 for registration as we have limited seats. Hello friends, We are starting a Weekend batch for Hindi from 20th September. The registrations are currently open. Please call 94835 07050 / 97396 07050 or write to us at welcome@goodtoexcellence.com to know more about this course. New batches for English (all levels), spoken Hindi and Spoken Kannada are starting from August 11th. Some batches of English also include Soft Skills and Personality Development modules. Hurry! Talk to us or write to us to know about it. There is early bird discount too for those who wants to book your seat before 8th August.